I sat down to this movie knowing nothing about it. Somehow I’d managed to escape every ad and trailer and assumed nothing more than George Clooney starred in the film and that is was possibly some type of action movie. I was right and wrong in that assumption. This is a man vs self drama as George Clooney plays Matt King, a Real Estate lawyer living in Honolulu and there are some beautiful scenes from the island of Kaua’i where the King family owns 25,000 pristine and untouched acres. This glorifies the paradise that is Hawaii, but also reminds us that even in paradise there is struggle, strife and betrayal. Matt descends from Hawaiian royalty and although he was born and raised in Hawaii he refers to himself as a “haole” or a white person living in Hawaii, which roughly translates to the term “no breath” or ignorant of local ways because of his inability to speak “Pidgin”, a local language. The family land is a looming controversy that moves in and out of the spotlight. There is a growing intensity as they close in on the sale of the property as it will make Matt and his passel of lazy, Tommy Bahama dressed cousins very, very rich. It will also affect the entire island community. Matt is the sole trustee of the land and the ultimate decision rests on his shoulders, but there is a more immediate problem at hand. A boating accident near Waikiki leaves Matt’s wife, Elizabeth, comatose and her future becomes clear as the film progresses. Throw in Matt’s two foul mouthed and unruly young daughters (10 and 17) and it really starts to get crazy. Another thing to note about The Descendants are the characters and the development therein. While we don’t see a lot of them that often, but they leave their mark very quickly. Some have a few lines and some don’t speak a word. For instance, the character development of Matt’s comatose wife plays a huge factor as we get to know more and more about her as the story unfolds. Smaller parts played by Beau Bridges and Matthew Lillard do just enough to keep Clooney in check and I didn’t get that scene stealing feel that some of his other movies emote. One character who surprised me was newcomer Nick Krause who acts as the comedy relief sidekick of Matt’s oldest daughter. This Georgetown, Texas native plays Sid, the wandering stoner teen who has a knack for saying all the wrong things, all of the time. To generalize the film, Matt is constantly overwhelmed with bombarding waves of money problems, death, moral decisions and parenting and it’s here that the machinery of narrative kicks in. I didn’t mind it since this character relies on indecision and the allowance of everything and everyone around him to dominate his life. I felt bad for this super rich guy and I don’t know why. It’s at once complex with a twist here or there in unexpected places as the characters are free to roam like an open ended role playing game. No one has a clear path and motive is scarce. Eventually the movie does a double ending leaving you half staring in the mirror at a family that is very normal, very real and at once impossible. 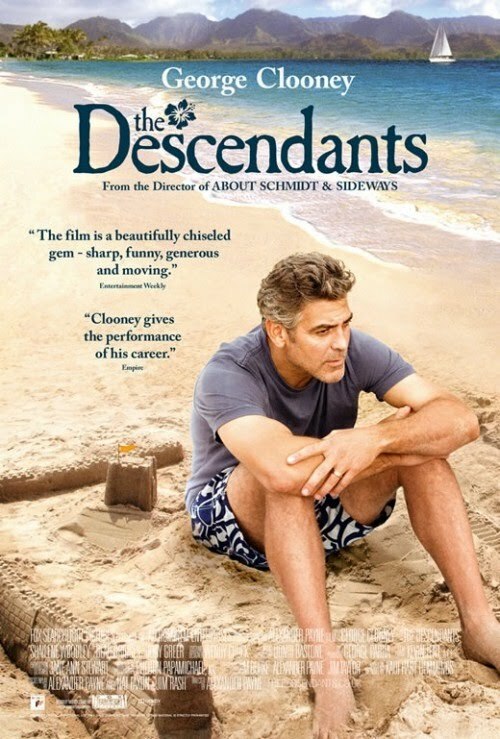 If nothing else The Descendants allows you to share a time with an interesting family during a point in their lives you wouldn’t have wished on anyone. That’s what this movie is about? Huh. I guess I had no idea either. Oh yeah, Alexander Payne. Really love Citizen Ruth! Haven’t seen Descendants yet, or Sideways. Maybe someone will lend a DVD to me.